Since about 1940, Alberta’s mean annual temperature has risen between one and 1.5 degrees Celsius. Most warming occurs in the spring, which now arrives about two weeks sooner, with temperatures as much as five degrees warmer in March and April than in the past. In addition, precipitation during the growing season has substantially declined over the past several decades. Climate change could have negative or positive impacts on forest regeneration, health and productivity in different parts of the province. In some areas, warming could cause drought and adverse effects on forests. In other areas, warming could present an opportunity for longer growing seasons and high forest productivity. Understanding the biological relationship between trees and climate, and how this relationship is integrated into Alberta’s seed transfer guidelines, is essential in managing the impact of climate change. Alberta Innovates Bio Solutions (AI Bio) and Alberta Environment and Sustainable Resource Development (ESRD) recently co-hosted two knowledge-exchange seminars in Rocky Mountain House and Grande Prairie. The purpose was to make forest companies and practitioners familiar with provincial seed transfer standards and existing opportunities for assisted migration (planting tree seeds native to one area in a different area) as a tool for climate change adaptation. Dr. Virginia Chavez, AI Bio Program Manager, says AI Bio agreed to co-host these seminars because of climate change concerns it heard from forest companies and feedback it received from ESRD about opportunities for assisted migration. There was a great need for seed transfer guidelines to be interpreted and applied correctly, and to inform forest industry practitioners not aware that existing regulations allow assisted migration in specific areas. The seminars also provided an opportunity to share and update industry on current research related to the impact of climate change on Alberta’s forests, possible counteractive measures and knowledge gaps that need to be filled. Chavez says facilitating this type of information exchange between the research community and industry is a priority for AI Bio, and it should result in overall better management of Alberta’s forest resource. About 60 foresters, forest company employees who order and use seed, woodland managers, ESRD area foresters, biologists, researchers and people who use tree seed in reforestation work attended the seminars. Leonard Barnhardt, Manager of the Tree Improvement and Seed Centre at ESRD, says a revision to Alberta’s Forest Genetic Resource Management and Conservation Standards (FGRMS), which regulates seed use in the province, is currently underway. Some of the major areas of policy scrutiny are in climate change adaptation, inclusion of shrubs as well as trees used in reclamation work in new revised standards, and further development of standards in relation to tree gene conservation activities. Chavez says that AI Bio, as a funding agency, has been working with ESRD and research organizations such as the University of Alberta to study the impact of climate change on Alberta’s forests. For example, AI Bio is investing about half a million dollars in three research projects being led and co-led by Dr. Andreas Hamann, Associate Professor in the hardwood genetics and climate change area within the Renewable Resources Department at the University of Alberta. The purpose of his research is to both guide the development of the Alberta FGRMS and provide knowledge to industry to help guide reforestation decisions being made on the ground on a case-by-case basis. He is a member of the committee that makes recommendations on FGRMS content to the government. 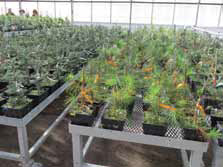 Dr. Hamann says seedlings with good genetic adaptability to current growing conditions often originate 200 to 400 kilometres further south, or 100 to 300 metres lower in elevation than the target planting site. Such human-assisted seed transfers, as part of regular reforestation programs, are cost-effective and provide a much greater likelihood of restoring and maintaining the commercial forest despite the adverse impacts of climate change. The Canadian Wood Fibre Centre (CWFC) continues to work diligently to provide a national woody biomass program contributing to the competitiveness and sustainability of the Canadian forest sector. Working closely with the Verschuren Centre at Cape Breton University (CBU), CWFC staff put together a workshop program that enabled woody biomass experts from across Canada to share their woody biomass knowledge and experiences. “Our focus for the workshop was to illustrate feedstock sources, mid-supply chain options and product opportunities,” says Tim Keddy, CWFC Wood Fibre Development Specialist. An additional focus was for those in attendance to better understand the wide variety of potential alternative woody biomass sources that are available. Keddy adds that CWFC took part in the workshop as a way to share the knowledge it has gained over the past 15 years related to the management, harvesting and delivery of woody biomass from a variety of sources, such as short rotation woody crops, harvest residues, and utility line easements. The attendees, numbering close to 50, were treated each day to a combination of presentations and local field tours highlighting woody biomass harvesting and woody biomass product options. The first day highlighted presentations from Derek Sidders, CWFC Regional Co-ordinator and Program Manager, providing an overview of all woody feedstock sources. Keddy supplemented this with information related to short rotation woody crops and the mid supply options of woody biomass harvesting, recovery and preparation. Luc Desrochers, Researcher for FPInnovations, provided in-depth insight on the characteristics, harvesting, handling and shipping of commercial forest residues and Dr. Michelle Adams of Dalhousie University provided an overview of local attitudes towards using forest biomass for energy production. The conclusion of day one included a field tour and discussion of other biomass sources and a short rotation woody crop plantation at a local farm. The Verschuren Centre provided an overview of their research program regarding helping advance knowledge related to investigating the potential for establishing short rotation woody plantations in the reclamation of historic coal mine sites. 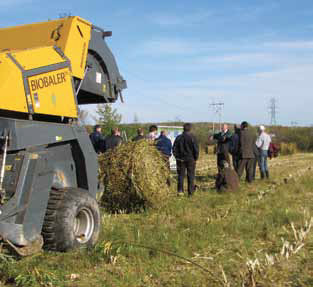 Those in attendance were also treated to a woody biomass harvesting demonstration, featuring, for the first time in Nova Scotia, the Anderson Bio-Baler, a woody biomass harvesting and baling system. The second day began with an overview of potential woody biomass product options which were then presented in more detail with focused presentations on the production of solid fuel, large scale power generation, bio-products, biochar, bio-oil, and activated carbon by local researchers and local industry representatives. A highlight was a tour of the CBU heating system that has been entirely modified from burning coal to using wood pellets as a fuel source. The conclusion of the workshop showcased a thorough field tour of the 60 megawatt, Nova Scotia Power woody biomass power plant at Point Tupper. The power plant, situated on the same site as the Port Hawkesbury Paper Mill, consumes between 650,000 and 700,000 tonnes of woody biomass per year, sourced primarily from within Nova Scotia. “It was a thoroughly enjoyable, practical workshop that was among the most informative and useful that I’ve attended,” says Dr. Ken Oakes, Industrial Research Chair - Environmental Remediation at the Cape Breton University. The workshop was one of a number of various demonstrations of woody biomass mid supply options hosted by CWFC at different locations across Canada over the past year. 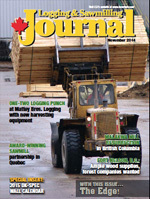 They are part of the “Development Of Innovative Techniques And Technologies To Cost Effectively Harness And Deliver Woody Biomass Sources For A Sustainable Canadian Bioenergy Industry” project, funded under the Program of Energy Research and Development for the Office of Energy Research and Development, Natural Resources Canada. “It was truly enjoyable to see and experience the interest and co-operation of the woody biomass industry in Nova Scotia,” says Sidders. Home to a new 60 megawatt woody biomass power plant and with two wood pellet plants in operation, including one owned by Shaw Resources, who hosted CWFC staff for a post workshop tour, Nova Scotia has shown a strong commitment to the utilization and commercial use of woody biomass. For more information on the topics covered at the workshop, contact Tim Keddy at (780) 435-7212 or tkeddy@NRCan-RNCan.gc.ca or Derek Sidders at (780) 435-7355 or Derek. Sidders@NRCan-RNCan.gc.ca.